Mol. Cells. Nov 30, 2016; 39(11): 777-782. Mol. Cells.Nov 30, 2016; 39(11): 777-782. Received September 21, 2016; Accepted November 7, 2016. Christensen, M.H., and Paludan, S.R. (2016). Viral evasion of DNA-stimulated innate immune responses. Cell Mol Immunol. , 1-10. KSHV evasion of different recognition receptors signaling. 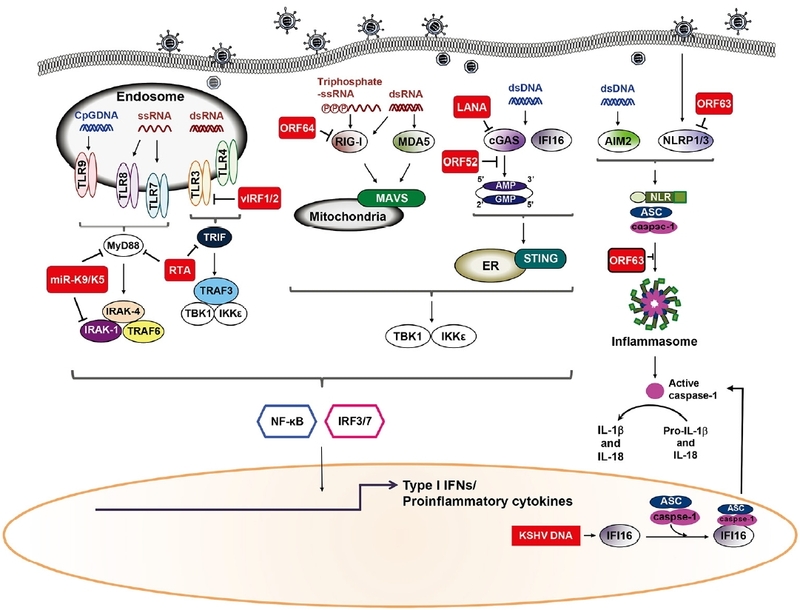 Recognition of KSHV viral components by host pattern recognition receptors (PRR) triggers signaling pathways that induce production of type I IFN and pro-inflammatory cytokines. Following KSHV infection of cells, TLRs utilize MyD88 and TRIF as adaptor molecules to recruit downstream molecules, which eventually culminates in the production of type I IFN and/or pro-inflammatory cytokines. Moreover, KSHV dsDNA accumulates in the cytoplasm and is recognized by cGAS and IFI16. In response to DNA stimulation, STING, an ER protein, relocates to the cytoplasmic punctate structures and subsequently recruits TBK1 and IKKɛ. Alternatively, dsDNA is transcribed into dsRNA polymerase III in a cell-type specific manner and is recognized by RIG-I. RLRs signal through the adaptor protein MAVS located on the mitochondria triggers production of type I IFN together with NF-κB. Inflammasome induction by KSHV infection, either results in the activation of IL-1β and IL-18 or inhibition of its production due to blockage of the NLRP1/3. Red squares indicate KSHV proteins.